Sometime after the creation of that part of the Forest of Lancaster known as Fulwood Forest in the late 11th century Preston townsfolk began creating assarts, or illegal enclosures, in the forest on the edge of their then northern boundary. These incursions were recognised and legalised by a treaty of 1252. In the treaty they are named as a purpresture, a word used to denote ‘An illegal enclosure of or encroachment upon land or property belonging to another’, to quote the OED. The extent of this purpresture is sketched in a very hazy fashion in the figure above by the principal historian of the Forest of Lancaster, Cunliffe Shaw. The impact of the Forest of Lancaster, and in particular Fulwood Forest, on the township of Preston has been considered elsewhere (Domesday Preston). 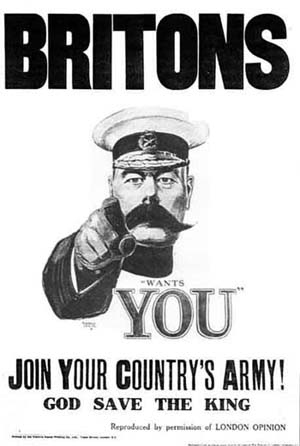 The aim here is to set more definite bounds to the purpresture than are provided by Cunliffe Shaw. The usual source for the history of the forest is Cunliffe Shaw’s The Royal Forest of Lancaster. Struggling through the dense thickets of Shaw’s text, it can become difficult to see the forest for the trees. A clearer introduction, even though it deals with only a portion of the forest, is Phil Hudson’s The Early History of Man’s Activities in the Quernmore Area. This is just one of a series of articles on Quernmore that Hudson has published in Contrebis, the journal of the Lancashire Archaeological and Historical Society, together providing a comprehensive landscape history of the area. All are available on-line. Hudson’s account is clear and succinct, and he never makes an assertion without supplying his evidence. Hudson knows his ground and produces a comprehensive description of the historic landscape. His account of the developments at Quernmore would seem to be mirrored at Fulwood. A similar situation probably obtained at Preston at the same time. King John had granted to the burgesses of Preston by charter dated 1199 recognition of the rights granted by Henry II in a charter dated around 1179. Among other things, John’s charter confirmed the burgesses’ right to an annual fair lasting eight days on the feast of the assumption of St Mary (15 August) and the right to pasturage in Fulwood Forest, together with the right to take wood for house building. If John was as keen to raise funds as Hudson suggests he might have been obtaining payments from the burgesses of Preston to allow other encroachments in the forest (activities covered by the words purpresture and assart). ‘Ennisbrock’ is Eaves Brook and ‘the water of Sannocke’ is Savick Brook. One minor point is that Lingard translates the phrase ‘apud Ribbelton Scales’ as ‘at Ribbleton’ rather than the full ‘at Ribbleton Scales’. Ribbleton Scales was the name given to the northern section of Ribbleton. 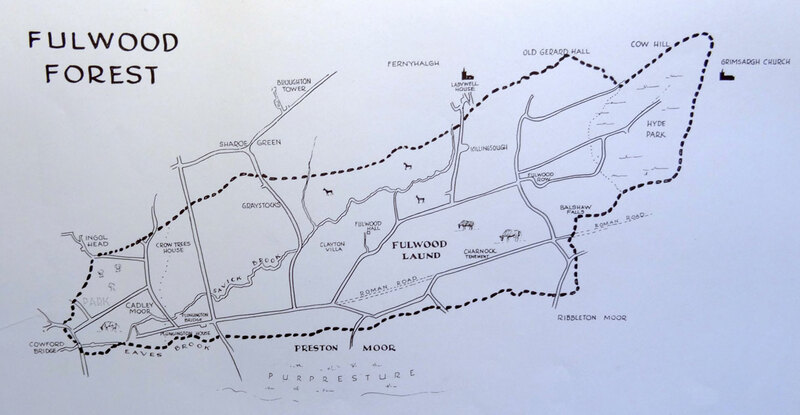 Lingard makes the point that ‘From this charter it appears that the inhabitants of Preston had, at different times, enclosed or occupied lands which were claimed as belonging to the royal forest of Fulwood. These are now granted to them by Henry III.’ This gradual encroachment on the forest lands is suggested by the phrase ‘as well of the old as of the new purpresture’. This early assarting is discussed in the treatment of Domesday Preston. Difficulties arise with the specific measurements in the document: 324 acres of land and ‘within forty perches of the cover of the said wood’. Since the length of the perch is not specified, the areas and distances could be more or less than the statute measurement (see Lancashire land measurement). It is difficult to square the 324 acres, no matter how long the perch, with the boundaries described in the following document of Henry III’s reign, unless the surveyors were using the more generous ‘wood acre’ rather than a field acre. 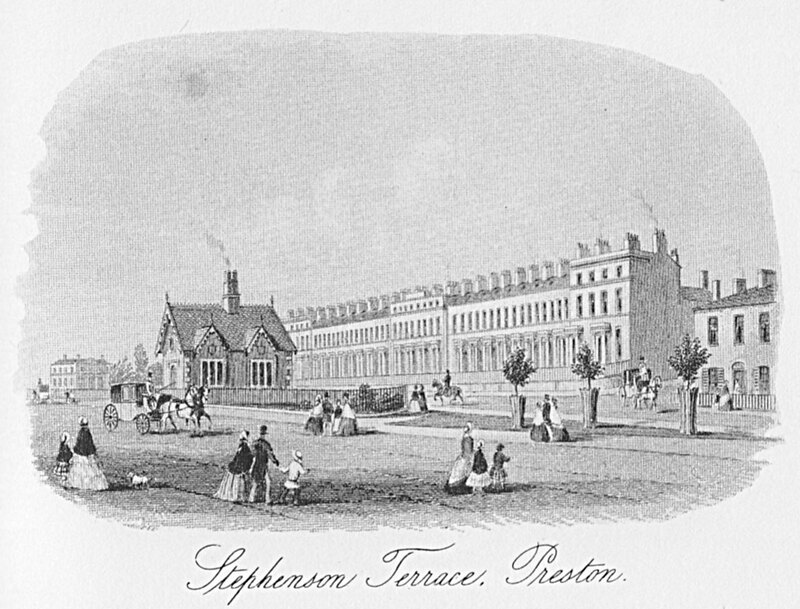 Plungington Hotel is the Plungington House of Farrer and Shaw, and again it begs the question, how do the authors know this is the location of the enclosure? It would be especially helpful to know the source for the 1255 perambulation which established an extent of 2117 acres. Shaw’s interpretations of locations are in bold; again, he does not supply any evidence for his speculations. The Scalefeld or Scale Field mentioned could be the north-west corner of Ribbleton Scales. The base of the medieval cross mentioned above remained in place until 1913, when it was moved to a new site besides the northern entrance to Moor Park, next to the North Lodge. 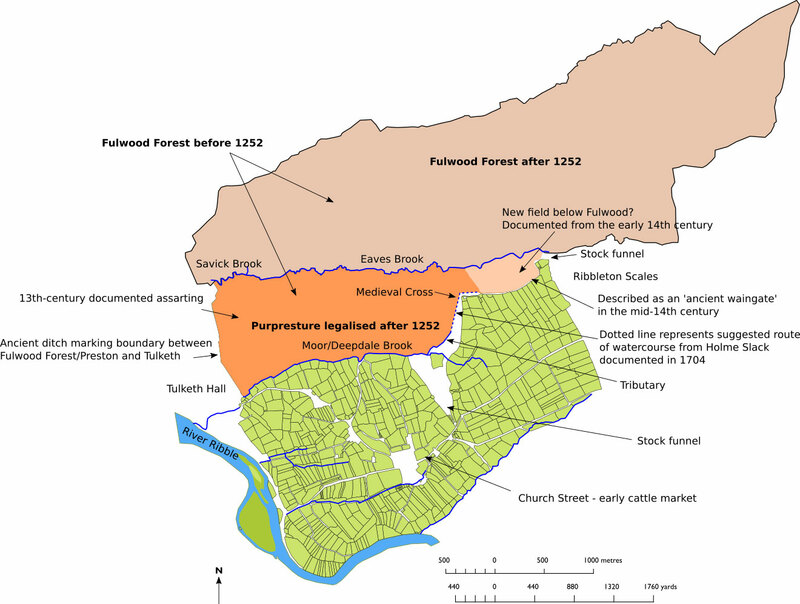 If Moor Brook and Deepdale Brook did not form the pre-1252 southern boundary of the forest, what is the alternative? The more detailed delineation of Fulwood Forest north of Eaves Brook makes it clear that the boundary followed natural features, especially streams and ditches, where possible. No obvious natural features for a pre-1252 southern boundary between Eaves Brook and Moor/Deepdale Brook suggest themselves. There are difficulties with the measurements in the 1252 charter. The purpresture on the above map has an area of 616 statute acres, whereas the charter mentions an area of 324 acres. However, it is not stipulated what size of acre was being specified (this measure varied considerably, see Lancashire land measurement). Another possibility is that this measure related to just the new purpresture and did not include the older purpresture mentioned in the 1252 charter, but this seems unlikely. Similar difficulties arise in the meaning of the phrase ‘that they come not within forty perches of the cover of the said wood’ in the charter, since the length of the perch is not specified. An interesting feature on the above map is the positioning of the stock funnels at the head of the ‘ancient waingate’ at the Preston/Ribbleton Scales/Fulwood border and the second leading off Preston Moor and into Church Street. Enormous herds of cattle would be brought from the north for the annual eight-day fair every August. The first funnel would allow these beasts to be brought to the moor, skirting the forest in its early days, to be gathered on the moor before being funnelled from there in batches into the Church Street cattle market (identified by Kuerden: ‘the cattell market ordinarily in the Church-street’ ) during the fair and for the weekly markets. The ‘new field below Fulwood’ on the map above is first mentioned in 1311/12 in the Townley manuscripts, according to the VCH  and is referred to several times in the next few years in the Gormanston Registers (Nos. 37 and 40). The field indicated on the map is the land owned by the Preston corporation in 1774, as shown in the Lang Survey. Another possibility is that the new field could have been enclosed on the north-west, for a deed of 1312 in the Gormanston Register (No. 64) mentions ‘the New field near the highway which leads to Broghtonbrygges [Broughton Bridge]’, which bridge was probably on the west of the forest (see Domesday Preston). Much of the above argument is speculative and the names of many places and people remain obscure. 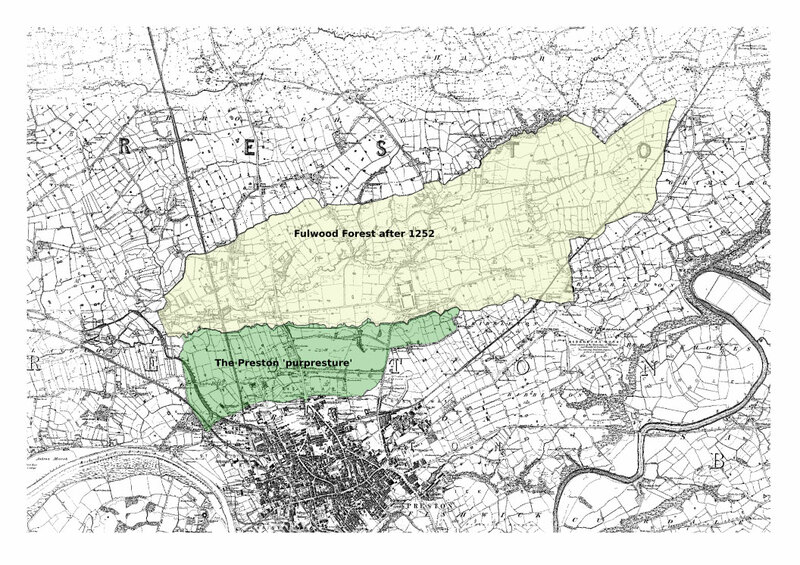 What is clear is that by the 14th century much of Preston’s waste or moorland had been enclosed. These enclosures are considered in more detail in the section under construction on the town’s pre-industrial landscape. R. Cunliffe Shaw, The Royal Forest of Lancaster (Preston: Guardian Press, 1956). Phil Hudson, ‘The Early History of Man’s Activities in the Quernmore Area’, Contrebis – Journal of the Lancaster Archaeological and Historical Society 25 (2000): 51–66. Shaw, The Royal Forest of Lancaster, 8; Hudson, ‘Quernmore’, 53. Shaw, The Royal Forest of Lancaster, 12. W. A. Abram, Memorials of the Preston Guilds (Preston: Preston Guardian, 1882), 3. John Lingard, The Charters Granted by Different Sovereigns to the Burgesses of Preston (Preston: I. Wilcockson, 1821). W. Farrer, The Lancashire Pipe Rolls (Liverpool: Henry Young and Sons, 1902), 423, https://ia802708.us.archive.org/4/items/lancashirepiper00exchgoog/lancashirepiper00exchgoog.pdf. Shaw, The Royal Forest of Lancaster, 107. Carole Knight and Margaret Burscough, Historic Fulwood and Cadley (Lancaster: Carnegie Publishing, 1998), 7. Shaw, The Royal Forest of Lancaster, 150–51. David Hunt, A History of Preston, 2nd ed. (Lancaster: Carnegie, 2009), 51. ‘Preston Court Leet Records’, accessed 29 January 2017, http://c5110394.myzen.co.uk/mw/index.php?title=Main_Page. R. Kuerden, A Brief Description of the Burrough and Town of Preston, and Its Government: Originally Composed Between the Years 1682 and 1686 … (Wilcockson, 1818), 7, https://books.google.co.uk/books?id=KCAwAAAAYAAJ. William Farrer and J. Brownbill, eds., The Victoria History of the County of Lancaster, vol. 7 (London: Constable, 1912), 94, fn. 52.